Although it has mostly fallen out of use in favor of the 38 S&W Special, the 32 S&W Long is still favored by enthusiasts due in part to its widespread adoption among northeastern U.S. police departments around the turn of the century (thanks to Teddy Roosevelt). 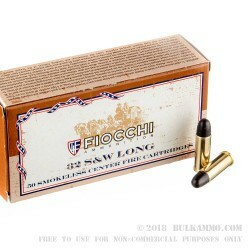 This cartridge is manufactured by Fiocchi, one of Italy's largest and oldest manufacturers of ammunition -- although they use gunpowder sourced from the U.S. 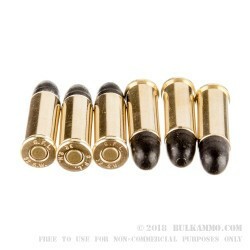 It features a lead round nose, and as such offers superior kinetic energy on impact, excels in close range situations (“card table distance,” as it’s aptly put), has good penetrating power, and takes up less room in a cartridge case. 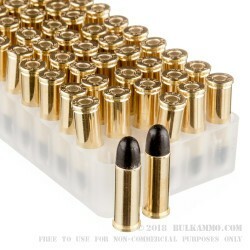 This cartridge is ideal for training, and a perfect investment for the hand reloader with its non-corrosive Boxer primed brass casing. 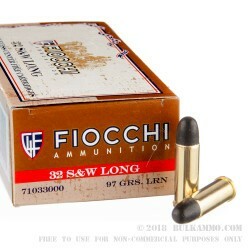 Fiocchi’s commitment to precision manufacturing without cutting corners is sure to reflect itself while you’re punching holes at the range.